Do you ever find yourself wanting a salad, but don’t feel like having the same old greens and dressing? 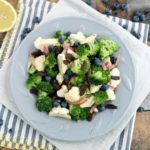 If so, this broccoli cauliflower salad could be just what you are looking for on those days when you want to be healthy and have a salad, but also feel like mixing it up a bit. Plus, this salad has bacon in it. Enough said. We got a little creative with this one and mixed in some unique flavors that really blend well together. 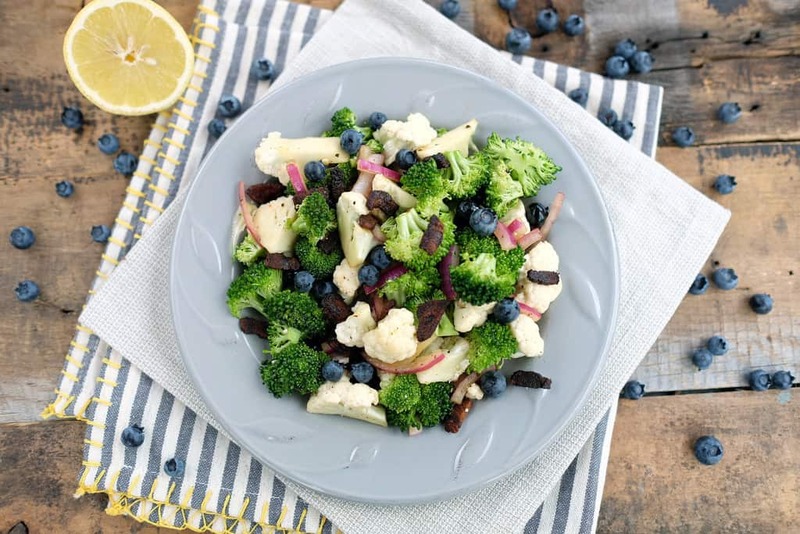 We threw together some onion, bacon, lemon juice, blueberries and a little oil with the broccoli and cauliflower, creating an explosion of different flavors and textures in each bite. The key we found was to chop up the broccoli and cauliflower into very small florets, so you can get a little bit of each ingredient with every bite. We made this simple salad on a Sunday to use for some lunches during the week but it could also be made as a refreshing summer side dish to take to your next BBQ or potluck. The leftovers kept well in the fridge and everything stayed crisp and crunchy. Go ahead and try this one out, you will be surprised by how much flavor is packed in this healthy salad. Start by heating a skillet over medium heat. Cut up your bacon into small pieces and toss it in the pan to cook. Cook the bacon to your desired crispiness (we cooked them up crispy to add a little more crunch to the salad). Set aside on a paper towel lined plate to cool. Next, chop up all of your veggies and put them in a large bowl. Add in the blueberries and bacon. Squeeze in the lemon juice and drizzle in the oil. Toss everything together and mix it well. Serve immediately or refrigerate and eat it later (it will keep for about a week in the fridge). I love the mix of flavours you threw together! I’m always looking for alternative and interesting salads to try, and this looks soooo delicious! We love it too, mostly because it’s easy and outside of the usual go-to salads we typically have. Give it a try and let us know what you think!